Industrial fishing fleets are traveling twice as far as they did nearly sixty-five years ago. They are also catching fewer tons of fish, say researchers from Australia and Canada. Despite all that traveling, per kilometer traveled, fishing fleets today catch one-third of what they did in the 1950s. The researchers, from the Universities of Western Australia and British Columbia, wrote about their study in Science Advances (citation below). Lead author David Tickler and colleagues mapped the spread and growth of industrial fishing fleets since 1950. They found that a small number of countries that heavily subsidized their fleets dominated global trends. A subsidy is money that the government gives directly to entities, such as fishing fleets. The government usually subsidizes because it wants to protect an industry. Over the 65-year period, the total area fished increased from sixty to ninety percent of the world’s oceans. Despite this massive geographical expansion, the catch rates of these fishing fleets have fallen significantly. These fishing fleets and those of the other twenty largest fishing nations have dropped from 25 to 7 tonnes per 1000 kilometers. This drop was over the sixty-five year period since the 1950s. These historical expansions were especially pronounced along the archipelagic waters and coasts of Southeast Asia, the South Asian subcontinent, and South America. Pauly is principal investigator of the Sea Around Us initiative at the University of British Columbia. This is further proof that subsidies paid to fishing fleets promote inefficiency. They also encourage unsustainable uses of fisheries resources, the authors wrote. Meeuwig heads the UWA’s Marine Futures Lab. ‘Far from home: Distance patterns of global fishing fleets,’ David Tickler, Jessica J. Meeuwig, Maria-Lourdes Palomares, Daniel Pauly, and Dirk Zeller. Science Advances, 01 Aug 2018: Vol. 4, no. 8, eaar3279. DOI: 10.1126/sciadv.aar3279. 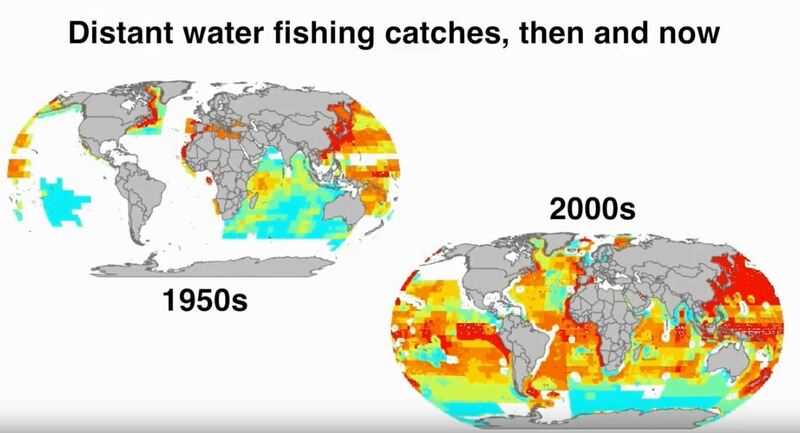 This Sea Around Us video explains what has happened to the world’s fishing fleets since the 1950s.